I’ve combined these two weeks because they’ve been pretty similar. I was supposed to increase my training during the last half of the challenge, but was thwarted by illness and injury. In week four I was stuck in a guillotine that was uncomfortable but not painful, so I didn’t tap, but the next morning my neck was killing me. I kept thinking it would get better until I finally gave up a week later and got a massage. Then it felt heaps better and I felt like an idiot for waiting so long. Diet-wise it could have been better too. Some new cookbooks arrived last week and I couldn’t resist trying out the recipes. But in general I’m very consistently eating lots of protein, getting lots of leafy greens in my diet, and I’ve reduced my non-vegetable carbs. I’m not too fussed, since I’m taking a fairly long-term view on this. I’ll be surprised (and quite pleased!) if I’ve lost anything during this challenge, but in hindsight 6 weeks (most of which I was still injured) was probably a bit optimistic anyway. My macronutrient breakdown is better than it was a month ago (though calorie-wise I’m still eating too much) and once I start training like I used to I’ll be back under 50kg. Kalo is the only one who hasn’t given up on the Bodyfat Challenge, so he is quietly confident that he will be the winner. with no problems, so yay! I fell off the wagon last week and actually gained weight. Cat gave us a bunch of cookies and snacks to take home after we helped them move – I knew it was a bad idea to accept them, because I’ve been snacking on them all week. My three main meals haven’t changed much, but the snacking is killing me. This is why I don’t buy processed snacks to keep at home – I don’t miss them if I don’t have them, but if I do have them then I eat them all at once. Also I haven’t been given the all-clear by the physio like I expected. I’m OK to do BJJ but apparently I’m still a month away from doing upper-body weight training. I was too ambitious with my exercise this week – I thought I’d be able to squeeze in a couple of extra BJJ sessions, but I’ve done two so far and been absolutely wrecked for days afterwards. I went on Monday night (got smashed by everyone!) – today is Wednesday and I’m shuffling around, putting on my clothes in tiny, painful movements, and just generally useless. I’m a bit disappointed at how long it’s taking (not to mention how much my BJJ has slipped). It’s not like I was sedentary for the three months that I took off, but I guess it will take awhile before my body gets used to everything again. So those are my possible reasons for gaining weight this week. It’s going to be super embarrassing at the end of my bodyfat challenge if I’m the only one who has actually gotten fatter! Unfortunately, the second week did not live up to my high hopes. I did manage to improve my breakfasts – I had to resort to yoghurt a couple of days when I was in a rush, but largely managed to have vegetable and protein-packed breakfasts. 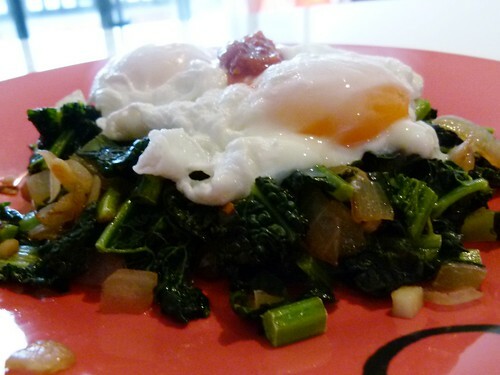 My current favourite is cavolo nero (I think it’s also known as Tuscan cabbage or black kale) chopped finely and fried in some oil with garlic and/or onion, with two poached eggs on top and a dollop of sriracha. It works out well when James is home – we split a bunch of cavolo nero between us. Breakfast was the only high point, and otherwise I got really slack. I would pat myself on the back for having such an awesome breakfast, then eat something carby for lunch, and then worry about what I had for lunch, which made me eat less than normal for dinner, which gave me awful headaches, which in turn made me skip my exercise sessions. In hindsight I can’t believe I was so dumb. Even if I eat badly at lunch I should just carry on as normal – trying to “compensate” for my poor eating just leads to more poor eating and less energy to train. I was freaking out a bit that my foolish eating and skipped gym sessions would stuff up my strength gains, but I managed a 70kg single back squat (138% bodyweight) on Sunday so all is good. Everything was a bit shakier than normal, so I will have to make sure I’m eating enough in the following weeks. Lesson learned. My weight was pretty similar to last week, hovering around 50.8kg. I’m seeing the physio today so hopefully I’ll be able to ramp up my training. I’ll start by adding a couple of BJJ sessions back to my weekly schedule and hopefully I’ll be able to start incorporating some upper body exercises into my workouts too. I was going to list what I ate every day, but that ended up being a very long, very boring list. I’m pretty consistently eating about 50-60% fat, 30% protein, and 10-20% carbs (most from fruit/veg, but occasionally from steel cut oats). I get about 1200 calories on rest days, and 1300-400 calories on days where I exercise. 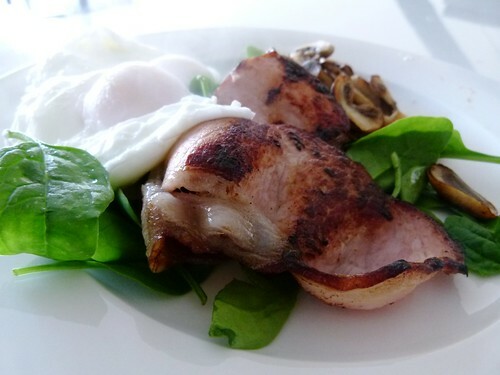 Breakfast: I usually had poached eggs with bacon, mushrooms and spinach. A couple of days I had steel cut oats with peanut butter or baked cabbage and sausage. Lunch: This was usually chicken with salad or steamed vegies. I get James to barbecue extra chicken thighs so I can just reheat them during the week. Snacks: Usually some papaya, full fat yoghurt, or steel cut oats with peanut butter. Dinner: This was similar to lunch – a protein with lots of vegetables. I try to have fish once a week, and beef once or twice a week. I haven’t lost that much weight-wise. I was under 51kg when I weighed myself last time, but I probably just didn’t drink enough that day. This coming week I am going to try and tweak breakfast so it always includes a lean protein and a vegetable. I might also try to increase the size of my lunches, or have some hard-boiled eggs on hand as a high-protein snack alternative in the late afternoon. I bet I can cram some more vegetables into my diet too. I also need to figure out my post-workout nutrition since it’s higher in fat than I would like. Exercise-wise I’m cutting out the jogging and walking and adding an extra session of yoga, sprints, and Body Attack (my aerobic guilty pleasure). Sunday was a wreck nutrition-wise. I didn’t have breakfast or lunch because Cat and I were selling our old clothes at the Take 2 Markets, so when I got back to Cat’s place I had chocolate wafer cigars and burger rings. So even if I don’t change anything from last week, as long as I don’t have another day like that, the second week will be an improvement on the first. The first photo I was about 61kg after I started working out and was eating pretty well. It’s from November 2008 but that’s pretty much how I looked at the start of 2010. There is muscle there, but it’s hidden under fat, though if you’d asked me I would have said that I didn’t have that much weight to lose. The second photo I was around 50kg. It was taken in December 2010, but I’ve been at this weight since May. So I basically did this in 5 months and have been coasting since then. Anyway, before and after photos! I realise that a bikini shot would have been better for comparison (and one where I didn’t have to zoom in like .. 10x), but there hasn’t been much bikini weather this Summer so this is the best I have. It’s not a dramatic Weight Watchers transformation where you see people standing in one leg of their old pants, but this is basically me minus 20% body weight, so I am quite pleased at the change. 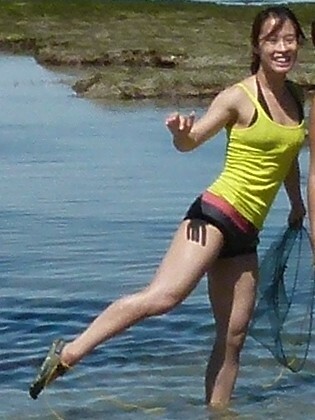 I ended the year 2010 leaner, stronger, faster, more flexible, and healthier than how I started it. Hopefully I can stop coasting and start improving again. I’ve gotten into the habit of going to the gym and just doing my regular workout (which don’t get me wrong, is not a slack workout). But I think I started getting into the mindset that all my big beginner gains were over so I stopped trying to improve as much. In 2011 I’m going to try and improve every time I’m at the gym, whether it’s in reps or weight. Improve pull-ups. I want to be busting out sets of 8-10 or even starting to attach weights. Clean up my diet even more and get back to a 40/40/20 macro split. Cut out potatoes, bread and grains except for the occasional cheat meal. Aim for 7+ serves of vegetables a day. Improve power. More jumping, snatches, cleans and explosive movements. Lifting-wise I want to get my squat to 75kg (currently at 62.5kg for 3 reps). I want to progress in my deadlift so that it’s higher than my squat. My other dream is a bodyweight bench. I want to get my overhead squat to 40kg. I want to drop to 48kg. I think I can still shed some fat around my quads and abs. 2011 is going to be a good year. I can feel it! A photo of me eating some fairy floss while a pigeon looks on enviously.